Many people take for granted just how important your bedroom is. A bedroom is more than just a place to sleep, it serves as your own private refuge. A space that is seemingly separate from the rest of the world. When designing new homes, many people are paying a little extra attention to the master bedroom, adding a few personal touches bringing the room from austere to warm, inviting and personal. Consider some of these design options when building a new house or remodeling an existing one. Depending on where you decide to build your master bedroom, you can have a lot of fun with a volume or raised ceiling to add height and suggest extra space to the room. This is where the ceiling is divided into two different tiers, similar to building a window frame on the wall. Raised ceilings provide the perfect location for both recessed and track lighting as well as a fantastic placement for a ceiling fan. Trim and crown molding can take it a step further, adding volume to the various levels and helps to catch the eye. If you really want to create a little magic for the master bedroom, consider adding a skylight. The volume ceiling becomes the perfect frame for a skylight and you can enjoy camping out under the stars, without the worries of rain and other inclement weather conditions. There is something to be said for emerging from you room in the morning through a set of double doors. Double doors for the master bedroom not only help to identify the room but also create a sense of majesty. With crown molding and trim around the door frame, you might even feel more majestic yourself, a good feeling to start you day off right. Double doors for the bedroom also serve a very practical purpose as they make it easier to get your furniture in, especially if you’re going for the total royal treatment with a king sized bed. 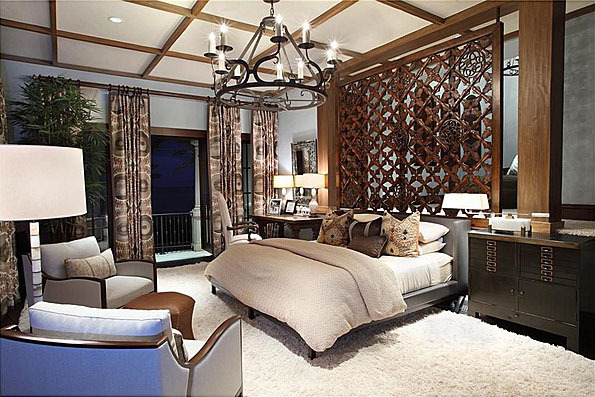 Another popular design trend is creating a sitting room or lounge within the master bedroom. Not only does this serve as a great place to cuddle up and watch your favorite movie, but it makes for a little retreat away from the hustle and bustle of the rest of the house. Some master bedrooms even have their own fireplace installed, adding warmth (both literally and figuratively) and a cozy feel to the master bedroom, making it the perfect place to relax and enjoy the comforts of a fire. The master bedroom is more than just another room in your house. It’s your room. Adding these special touches not only helps to distinguish it, but allows you to express yourself in ways that you can’t in the rest of the house. If you’re building a new home or planning on remodeling an existing one, take some time and consider what special touches you can make to the master bedroom. By designing your master bedroom to you own personal tastes, you create a safe haven where can truly relax, something far too often overlooked when we contemplate how busy our daily lives are.